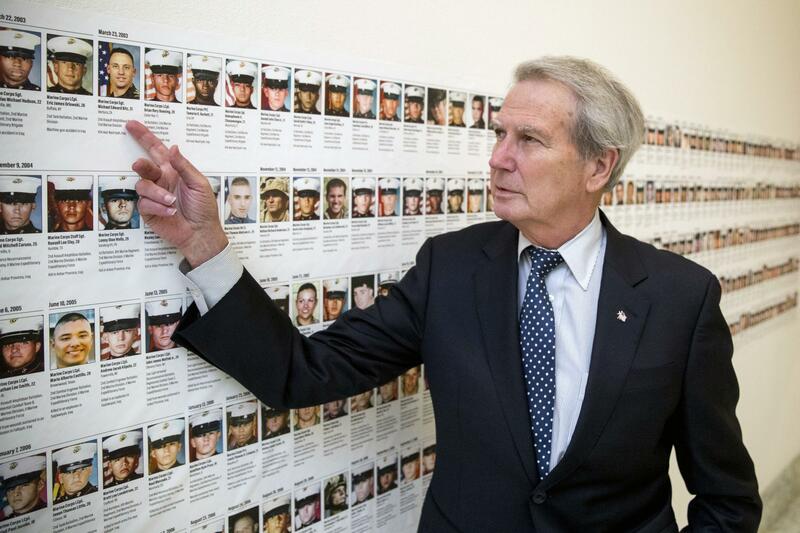 FILE - In this Oct. 25, 2017, file photo, U.S. Rep. Walter Jones, R-N.C., points at a photograph of Marine Sgt. Michael Edward Bits of Ventura, Calif., the first military funeral he and his wife attended, and one of the many pictures of soldiers killed this century based at Camp Lejeune, N.C., along a hallway leading to his office on Capitol Hill in Washington. North Carolina Congressman Walter Jones died Sunday, the day of his 76th birthday. Jones gained a reputation as a political maverick during more than 24 years in Washington. He represented North Carolina's 3rd District as a Republican, after serving in the North Carolina legislature as a Democrat. And his demeanor earned him friends on either side of the aisle. He was once voted the nicest member of Congress. Democratic Congressman G.K. Butterfield represents the district right next door to the one Jones represented. He reflected on the life and work of his close friend with WUNC producer Will Michaels. Q: You just heard me describe a little bit of his legacy, but how would you describe it? I represent 14 counties in eastern North Carolina. Walter had some 17 counties, so together we had 31 counties, which is almost one-third of the entire state. As such, we became friends and worked every day, talked every day, to try to uplift eastern North Carolina. Eastern North Carolina has a lot of challenges and it’s going to take bipartisan solutions to solve many of the problems that we’re facing. He knew that and I know it as well. He served with great compassion. He was a voice for the military. He was voice for our veterans. He never let a day go by in which he did not do something to honor and celebrate our military. And Walter was proud of being in independent. He was affiliated with the Republican Party, but he did not let partisanship guide his votes. Q: Perhaps the most well-known example of his independence was his deep regret for voting to support the War in Iraq. I ask about this because you went to Washington shortly after the war started. I’m just curious as to how you saw his outlook on the war change over time. We had dozens of conversations over the last 15 years about that vote. He regretted it very much. He came to believe that America had no compelling interest in Iraq, that there were no weapons of mass destruction in the country, and that it posed no threat to American security. He just felt that it was fundamentally unfair to put our soldiers, sailors, airmen and Marines in harm’s way. He did everything within his power to correct the record and let veterans know that he’s a veteran’s Congressman. Q: Along those lines, as two members of Congress with different ideologies, do you think you were able to learn from one another? I think we did learn from one another. We talked very often about the various issues that confront our country. He felt that the national debt was too high and that we were continuing to pile on the debt for future generations. I agreed with him to some extent, but I continued to explain to Walter that we could not shut down on middle class families and low-income communities who needed federal resources, and there has to be a balance between those two interests. He certainly understood that. He was a fiscal hawk. He was a strong defender of our military. He was a compassionate conservative. I refer to him in that way. Yes, he was conservative, but he wasn’t radically conservative. Q: Do you have a favorite story or moment with Congressman Jones? Oh, I have so many that I could mention. One that comes to mind involves the Wilson Municipal Airport. Walter and I both represented Wilson County once upon a time. Wilson Airport needed some federal resources to expand the runway, but the FAA would not give any type of credibility to our request because of the Rocky Mount Airport. They said it was too close to each other. Well, the FAA was measuring the distance in nautical miles, and not in actual miles driven. He just couldn’t accept that under any circumstances. He became very upset with the FAA because of their insensitivity for the need to invest in the Wilson Municipal Airport. U.S. Rep. Walter Jones of North Carolina died this Sunday at age 76. He was the second in his family to serve in Congress and was known for voting across party lines and for crossing those lines himself. He served as a Democrat in the North Carolina General Assembly for five terms before switching to the Republican party ahead of his first run for the U.S. House.